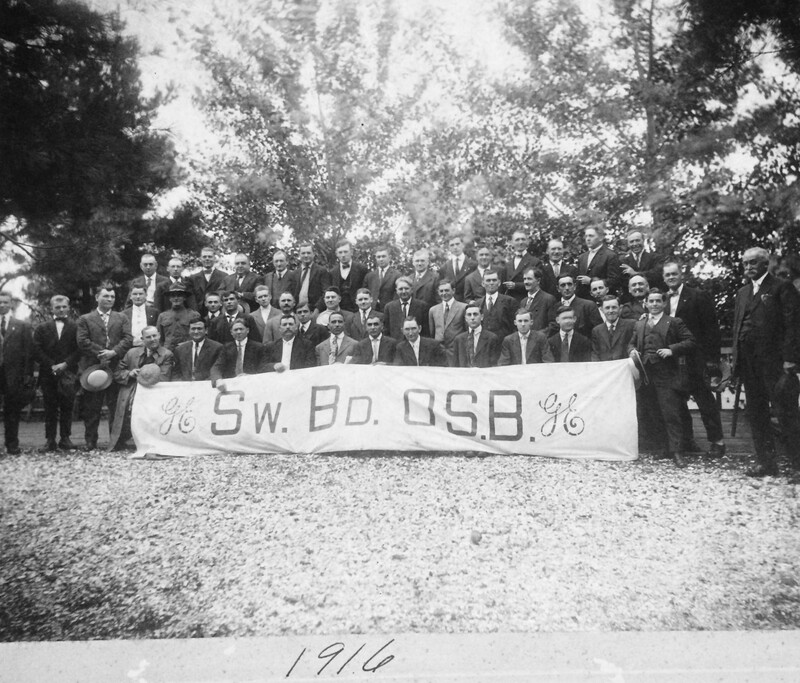 I found this picture of a GE gathering dated 1916–I’m not familiar with the abbreviated organization they are representing, however. If you know what the initials stand for, send me a message: historian@villageofscotiany.gov. Here are the edited notes from the Village Board for September and October, 1916. Payment to the Schenectady County State Highway repair fund ($305.53); a refund to a village resident for an incorrect tax assessment ($1.50); settlement of an assessment problem with the New York Central Railroad (assessment of property to stand at $180,000); and the usual list of monthly bills. They also reviewed the financials for the previous 6 months. A request for water mains to be extended in Marcelis Ave. was referred to the Water Committee for the next year’s budget. The hearing on Sacandaga Rd. paving opened at 8:30, no objections were made, and the hearing was closed. Bills were presented and approved for payment. Various routine financial matters were taken up, including payments on sewer contracts, and bills were presented and approved for payment. The Water Committee was instructed to have the outside of the water tank painted with one coat of graphite paint at a cost not to exceed $60. Rent to be paid on the safe deposit box at Schenectady Trust Company. Pay the school tax on Village property. Pay $50 for Fire Department inspection. Pay James Bliss a reimbursement for sewer expenses on Holmes St., $29.55. After investigation, it is determined that the sidewalk and pavement near the curb at the southwest corner of Mohawk and Ballston Ave. are not in the proper position. It needs to be corrected with the proper foundation. Also attached to these minutes is a copy of a document requesting the State Highway Department to improve Sacandaga Road by paving it in concrete.